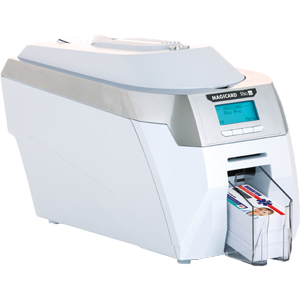 Built for professionals, the Rio Pro's superior card printing quality, reliability and patented HoloKote (Watermark) technology make it the most unique and powerful card printers on the market. With both USB and Ethernet connectivity as standard, it can be easily integrated into any office or security environment. Magicard's patented HoloKote security technology adds a watermark to the card as it is printed - it requires no additional consumables and can be customised to an individual logo design* - enabling true security at no extra consumable cost. The Magicard Rio Pro comes with a huge 36 month RTB warranty which includes a FREE HotSwap unit should your printer require a workshop repair during the warranty period. What does this mean? It means that we'll ship you a loan Rio Pro printer whilst your printer is under repairs, keeping your card printing downtime to an absolute minimum. Compatibility: Windows XP, VISTA, 2003 Server, 2008 Server, Windows 7, 2012 Server, Windows 8 (driver operates with 32 and 64 bit Windows). Custom HoloKote designs may have additional charges as quotes by ID CardWorld on application.